My mom taught me growing up that if you do something right the first time, you never have to do it again. I took on this mantra my first year of teaching. To everyone else I looked like a hardworking, type A teacher doing the best she could in her first year, but in my mind I was chanting my mantra. I would often work 12 hour days; getting to school by 6:40 and leaving well after 6:00 at night. I would joke with my principal and say that next year I would be the laziest teacher in the building, and I still do this today. I have realized that “next year” will never come for me. Working past 3:45 might not be for everyone, but it is for me. I am a life long learner, and I am always interested in learning about new and inventive ways to reach out to my kids. When I first knew I was going to be a 4th grade teacher, I went to buy a new computer. Something inside of me screamed, “You need a Mac,” and I am so happy that it did. 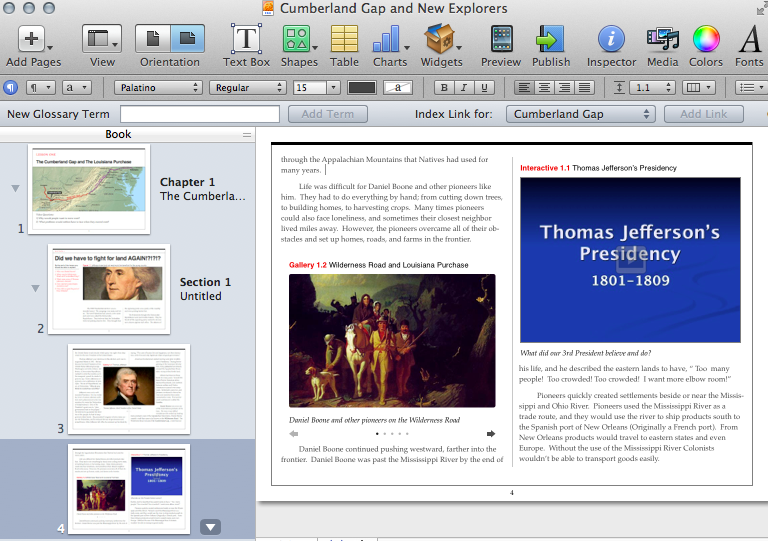 My newest current obsession is IBooks Author. This program allows an educator to take full control of his or her classroom. When I first heard about this program and how it allowed you to “glue” all of your videos, keynotes, text, and photos into an IBook, I was ecstatic. You can even put in a “widget” that assesses what your students understanding after they read the lesson and gives them immediate feedback. It doesn’t take to much time to put one of these jewels together. The best thing about these books is the fact that the teacher, not a publishing company, gets to put the book together. You can place exactly what your students need to learn on the pages how you want to, and once it is created you never have to do it again. That is, if you follow my mom’s advice and, “do it right the first time.” I have been focusing on creating Social Studies IBooks this year, and next year I want to focus on Science. However, you can make an IBook on whatever standard, lesson, or thrill that comes your way. Your standards change and you need some materials? Perfect! You can make an IBook. Your current materials don’t cover all of your standards? Make an IBook! This could seem like a huge undertaking for one teacher (and it is), but what if every person on your grade level created an IBook for one unit? 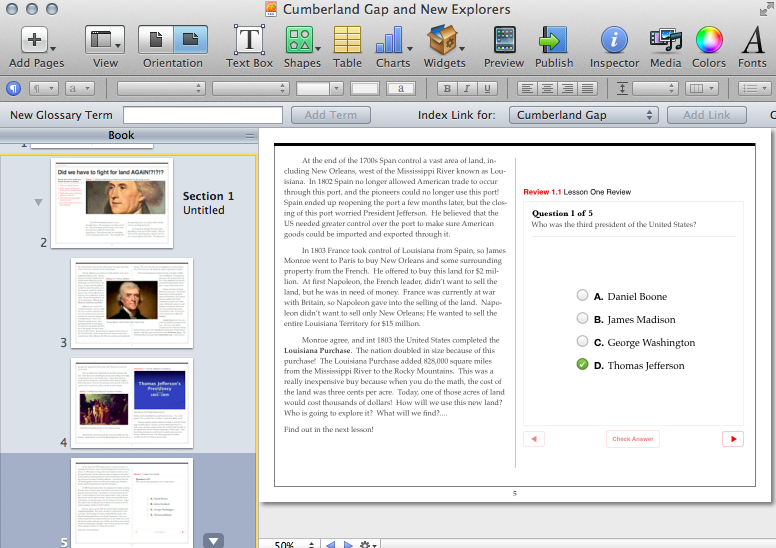 Soon, you could convert your classroom to an IBooks classroom in a month. Another fantastic aspect of converting from old school books to IBooks is that you can focus on the students that need your help. You know the students that can already teach themselves in your classroom? Let them! Spend time with students that still need the scaffolding. This tool allows you to release the responsibility of learning the material to the learner, and you can check their understanding by looking at the score at the end of the book. If you think you can’t do it, you can! If you are having trouble email me, and I would be happy to help. I am also willing to do any school PD within the state of South Carolina.